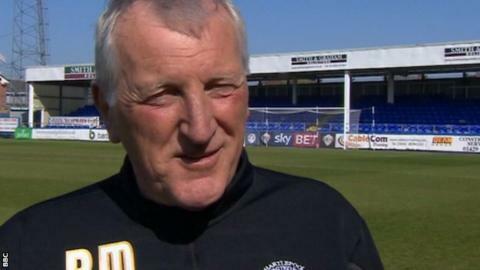 Manager Ronnie Moore says Hartlepool United need to show the desire to decide their own fate in League Two in the final two games of the season. Pools, one place outside the relegation zone, have a one-point lead over Cheltenham Town and are two points clear of bottom club Tranmere Rovers. Victory against Exeter City at Victoria Park on Saturday would be enough to guarantee Football League status. "The big thing is it's still in our hands," Moore told BBC Tees. "We've got to go out there on Saturday, in front of a massive crowd, and show the fans that we've got the same desire they've got. "They're [the fans] desperate to stay in this league, I'm desperate, we need the players to go out there roll up their sleeves and put a real big shift in. "If we squeeze the life out of Exeter and stop them playing then, maybe, it could be one of those days that don't come round that often - it could be a good time here." The fight to stay in the Football League could go down to the final game with Pools travelling to Carlisle. With mobile phones now able to deliver immediate goal updates, fans pressing portable radios to their ears are becoming a thing of the past. However Moore is keen to keep away from the news affecting their rivals. "I don't want to know either way," he said. "I'm sure the crowd behind me will be shouting and screaming so I might have to wear ear muffs. "Whatever happens we've got to win first, if we do our part there might be a celebration."